App Manager's Authentication feature provides the ability to select the security type you wish to use to secure your applications. Check the security option you want the application to use. Click Save to save your changes, or Cancel to cancel your changes. Will disable any security checks and will leave all functionality open to anyone who has access to the application and services. This option should only be used during testing or on a secure network. This mechanism can be enabled by removing any previously configured security configurations and setting the “appSettings” key “BypassSecurity” to “True”. Will use the application's security mechanism - which stores and manages users, roles, and privileges internally. The users, roles, and privileges can be managed through the application interface. Application features are shown/hidden based on user privileges and services are secured through token-based authentication based on registered users and defined roles. This mechanism can be enabled by removing any previously configured security configurations and making sure the settings in the “appSettings” key “BypassSecurity” is set to “False”. Will authenticate users and roles based on the built in Windows authentication mechanism. This option requires that the application server (IIS) is on the same domain and has read access to the domain's Role/Group store. The users and roles that drive this security policy can be read from Active Directory or configured using the application server's user/groups functionality. Application privileges are still stored using the applications built in security mechanism, but the users and roles are stored and checked using windows authentication - privileges are simply mapped to windows roles/groups. Heads Up! When using "Windows Authentication", you must disable "Anonymous Authentication" and enable "Windows Authentication" in IIS for this application. Will authenticate users and verify roles based on the configured Security Token Service (STS) metadata. An STS is the service component that builds, signs, and issues security tokens according to the WS-Trust and WS-Federation protocols. An STS can be a cloud STS such as a LiveIDSTS, a pre-built STS such as Active Directory Federation Services (ADFS) or a custom STS. On authentication, STS should return identity information such as name, e-mail address and roles as claims. Heads Up! When using the federation (STS) security mechanism, you must make sure that all roles and privileges are completely, and correctly, setup to work in the "STS" configuration/environment before applying this security profile. You must have an "admin-equivalent" role setup with all privileges assigned to it, so that your federated identity will be able to login as an "administrator." You will not be able to login with any built-in application accounts after applying this security mechanism. Before applying this setting, you will need to change the Administrator role name in Roles and then update the "Admin Group Role" in the apps Security Settings. Enter the STS Metadata Location - this is where the service is located. Enter Realm and Audience URL - these two parameters were used to set up the service and must match or there will be an error. Optional: Enter the protocol message Name and Value parameters. Will authenticate users and roles against IdentityServer3. 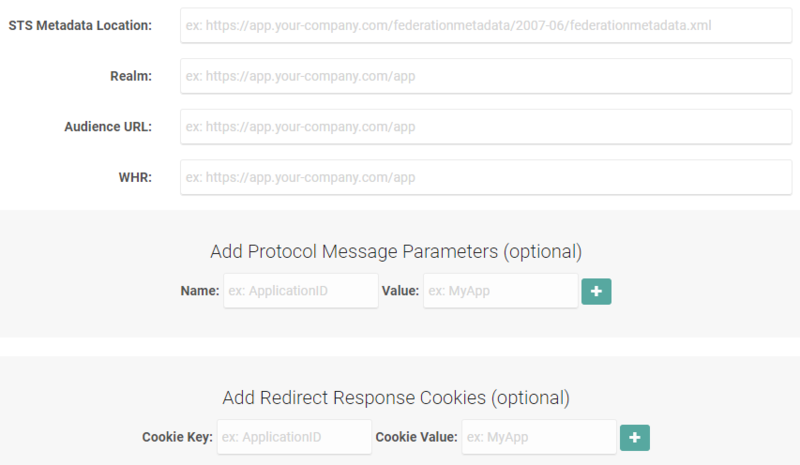 IdentityServer is a framework and a hostable component that allows implementing single sign-on and access control for modern web applications and APIs using protocols like OpenID Connect and OAuth2. It supports a wide range of clients like mobile, web, SPAs and desktop applications and is extensible to allow integration in new and existing architectures. You can learn more about this option here: IdentityServer Documentation. Enter the Authority, Client Id, Redirect URL, and User Info Client URL. Note: More details and information regarding security can be found in the Application Security topic. Tip: If you're looking for information regarding authenticating with ArcGIS Portal, please refer to the Configure Portal for ArcGIS topic.